What Might You Need A Auto / Car Locksmith for. - We are able to come to your location withdraw the key from the lock. Then if requested either make you a whole new key or just fix and repair your existing as this part enquires extra costs a lot of people tend to just go home and grab there spare key. We do offer a fix and repair service as one of our Auto locksmiths Services. - This problem 9 /10 has something to do with the transponder inside the key. Which either the Transponder is damaged or has fallen out of the key and the customer have not realised. James Cardiff Locksmith your recommended Auto Locksmiths in Cardiff can come to your desired location were the vehicle is and program a new transponder to your vehicle using our highly efficient programming software. Our software is able to program 80% of the vehicles on the road. Were transponders aren't damaged and the keys isn't lost the transponder this has an underlining problem with the cars electronics and would need to be dealt with and the main dealers for that car as our specialist Auto Locksmiths are not mechanics unfortunately. A good way to tell this is if the customer has a second key to try to see if that second keys works for the vehicle and if it does that the initial key has a fault rather than the car. If neither keys work then this is a good tell tale sign to say there is a fault with the Car rather than the keys. James Locksmiths Cardiff offers new key replacement on the majority of the cars today via our car / Auto Locksmith Service. Having to order a key from your dealership can be a time consuming proses and eventually more costly due to having to get the car recovered then having time off work running back and for. Our dedicated Auto Locksmiths and Car Locksmith in Cardiff can be with your selves within 30 minutes providing we have the reverent key in our stock. Dealer ships can take anything up to two weeks of getting your car back on the road. Auto Locksmiths in Cardiff can take as little as 1 hour to get you back on the road and the latest being 2 days if keys is not in stock which is huge a huge difference. This makes our service of being your local car and Auto Locksmith special to your selves and keep the disruption to your day as minimal as possible. Feel free to call our 24 hour Emergency Car Locksmith number on 07967725135, 7 days a week. This auto locksmiths service is one that we probably see the most. For some reason cars cannot tell that the keys are in side the vehicle and when actuators brake the car cannot tell if the doors have actually been opened which tells the car to re-lock its self. This is because the Customer have not turned on the ignition to tell the automobile or car that there is someone inside. Were people have also opened the boot and not opened any doors this tells the vehicle that no one is inside so to re-lock its self as a security protocol. This is were people leave the keys in the boot and gets really frustrated but the car is only acting in there best interest to prevent the car being left open. 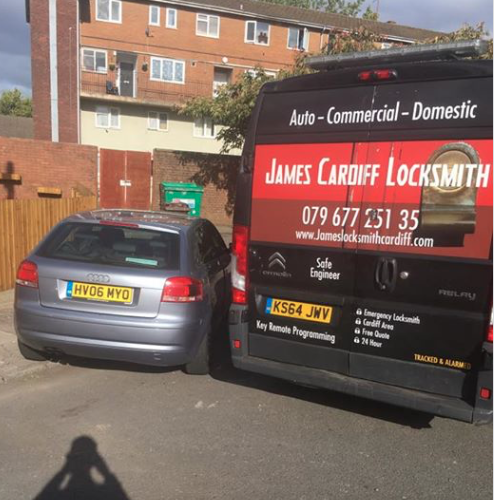 James Cardiff Locksmiths have regular calls to open all types of vehicles as a lot of people only have one key and in certain cases people leave there spare key in side the vehicle. Our Auto Locksmiths service for opening Cars takes approximately 5-15 minutes to open most cars on the market today. If you ever feel you need a Car Locksmith James is the locksmith you need. Call James Cardiff Locksmith any time, We are open 24 hours a day 7 days a week. We are able to open 100% of cars and 95% in under 10 mins. Like any Auto locksmith we can struggle to open certain cars but there is always key factors when we are struggling to open your vehicle.